Open the Operations console with an account that is a member of Operations Manager Administrators. 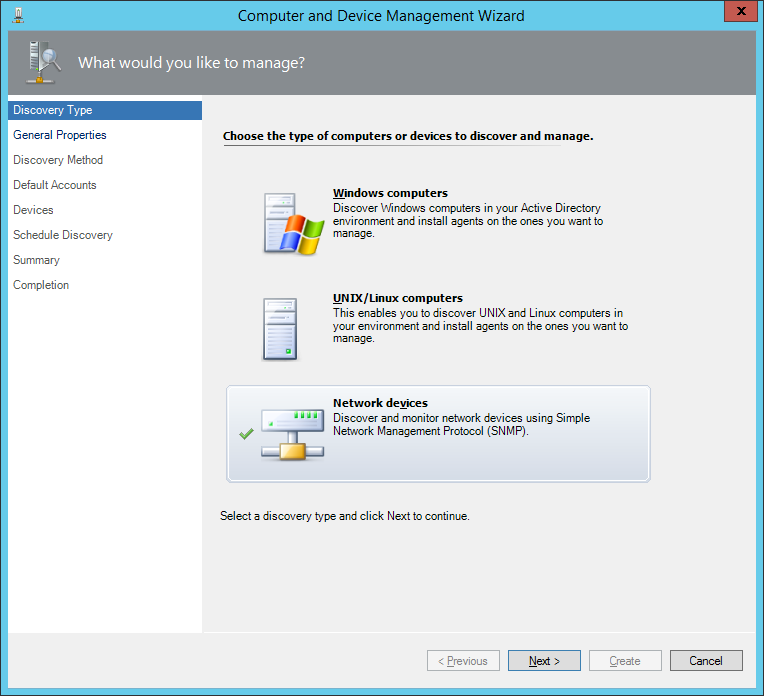 Navigate to the Administration workspace, right-click Administration, and then click Discovery Wizard. 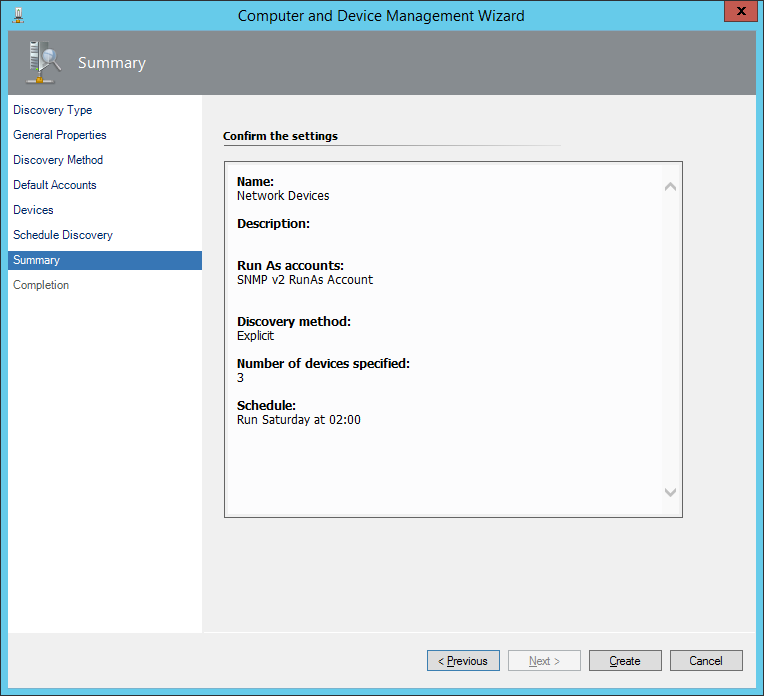 On the Discovery Type page, select Network devices, and then click Next. 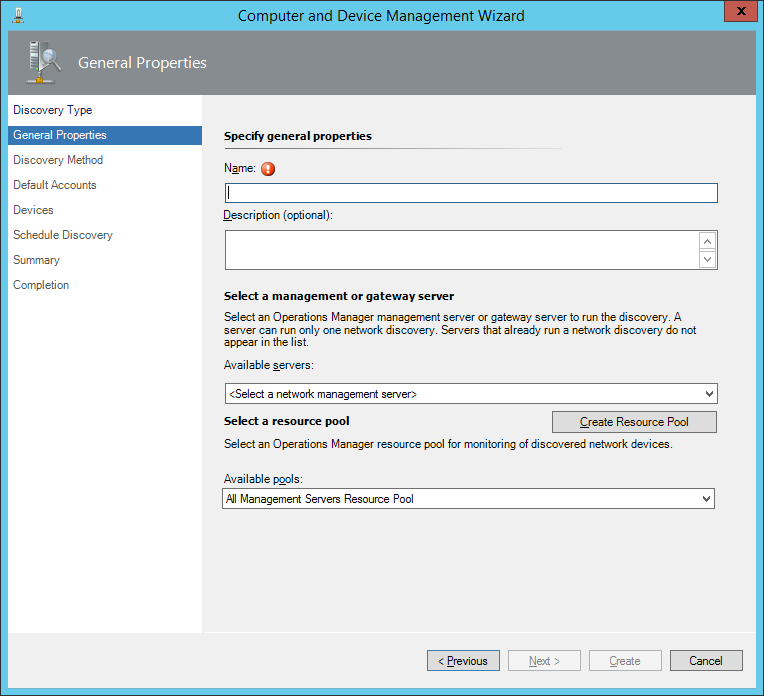 On the General Properties page, provide a Name for the discovery rule, select a Management Server to run the Discovery rule, and select or create a Resource Pool that will monitor the devices; then click Next. 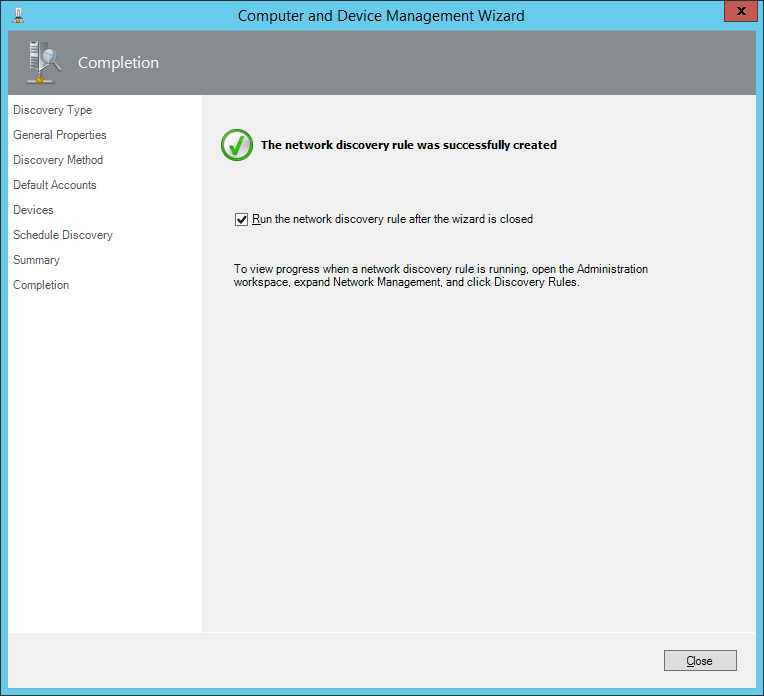 Note: If you know all of the network devices that you want discovered, you should use explicit discovery. Recursive discovery can discover devices that you have no business need to monitor and as a result, can increase the administrative workload of monitoring your network. On the Default Accounts page, select or create a Run As account, then click Next. On the Devices page, click the Add button. Note: This procedure describes how to add devices one at a time. You can also add multiple devices by clicking the Import button to import a text file with a list of IPv4 addresses. This file should have a single IP address on each line. After import, the IP addresses are part of the discovery rule and the text file is no longer needed. Note: If you select ICMP and SNMP, the device must be accessible by both protocols or it will not be discovered. If you select ICMP, discovery will be limited to the specified device, and monitoring will be limited to whether the device is online or offline. 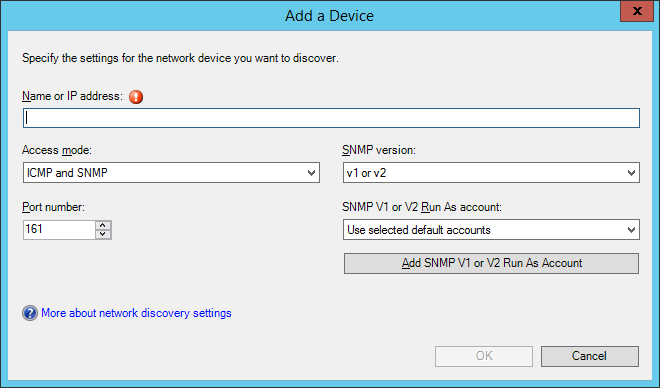 Note: If you are discovering devices that use more than one SNMP community string and therefore have multiple Run As accounts, you can retain the default value of Use selected default accounts in the SNMP V1 or V2 Run As account field. 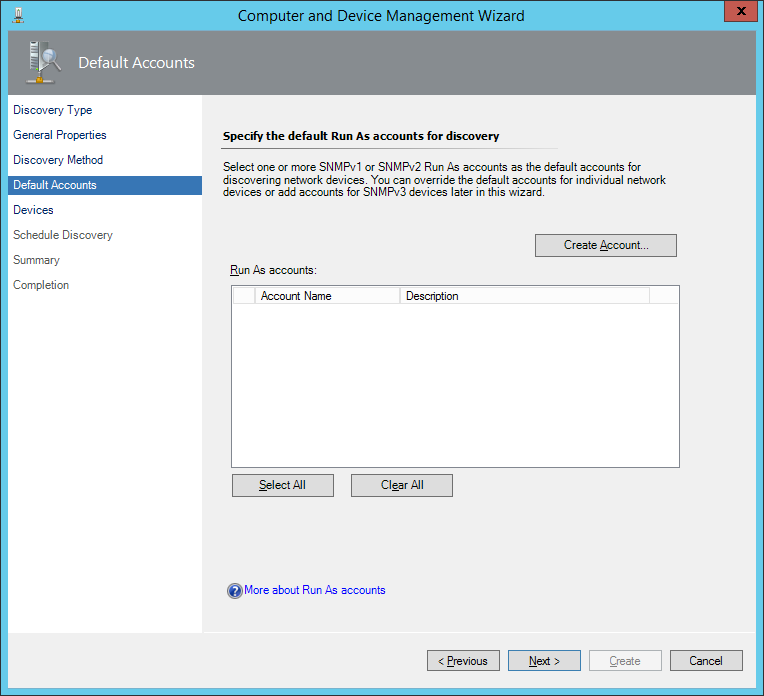 When you do this, the Network Devices Discovery Wizard will attempt to use the community string for every Run As account that you selected on the Default Accounts page against every device that you add to the discovery list until a community string succeeds. 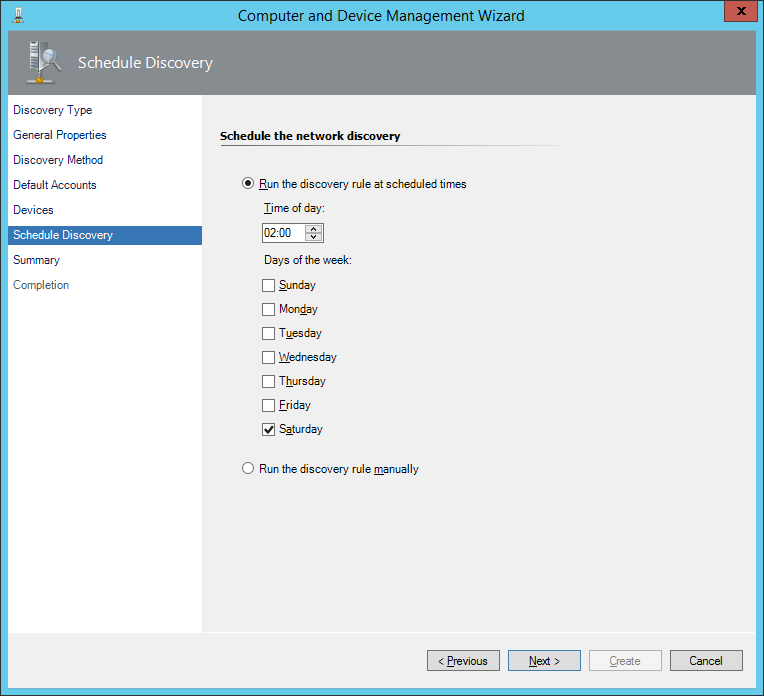 Note: The Advanced Discovery Settings button on the Devices page opens a dialog box that contains a number of settings that you can use to configure discovery of network devices, such as number of retry attempts. 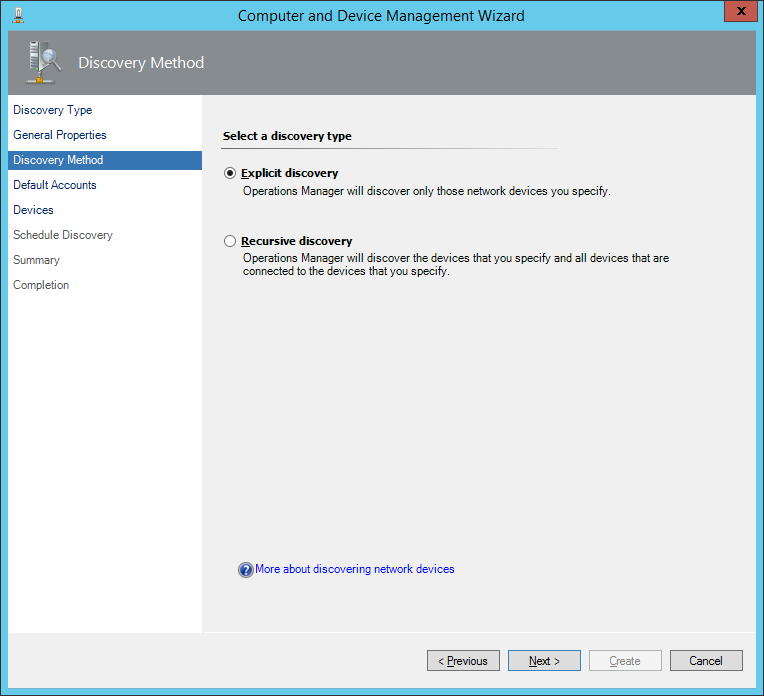 If you know you are going to discover more than 1500 devices, you must change the Maximum number of devices to discover in Advanced Discovery Settings. Note: We recommend that you do not run network discovery more frequently than twice per week because network discovery can take hours to complete and may place an excessive load on the management server or gateway server during discovery. 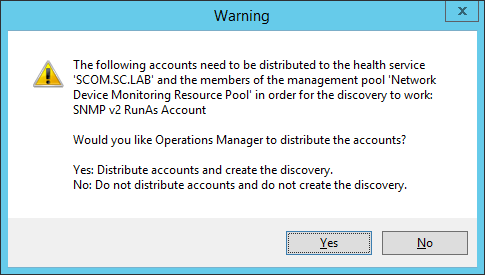 You will see a Warning popup that reads “The following accounts need to be distributed to the health service management server name in order for the discovery to work: DiscoveryNameRun As Account. Would you like Operations Manager to distribute the accounts? Yes: Distribute the accounts and create the discovery. No: Do not distribute the accounts and do not create the discovery.” Click Yes. 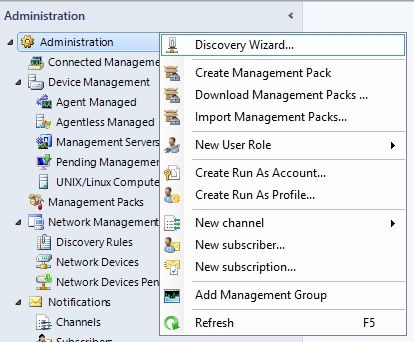 Note: It can take several minutes for the network discovery rule to appear in the Operations console and begin discovery if you select Run the network discovery rule after the wizard is closed. 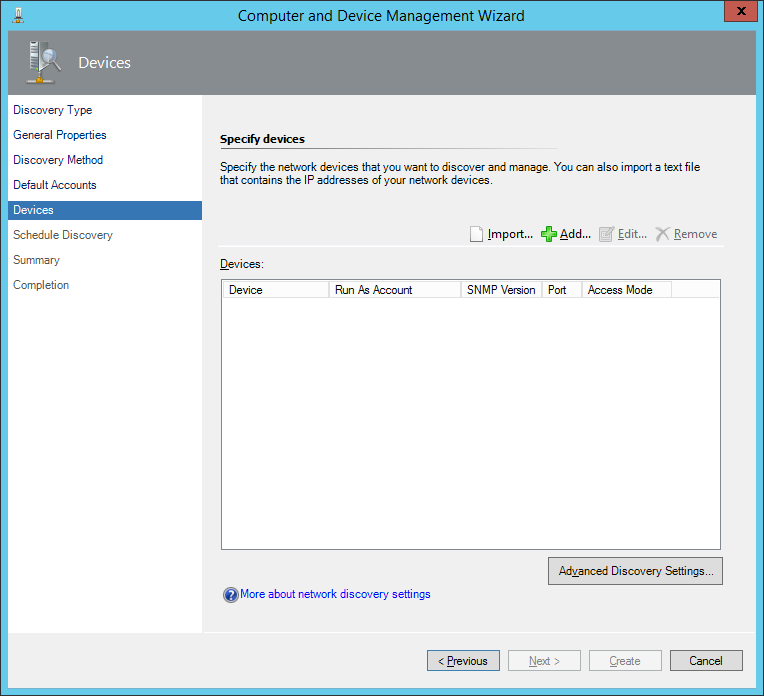 To monitor the progress of network device discovery, watch the status column of the discovery rule.